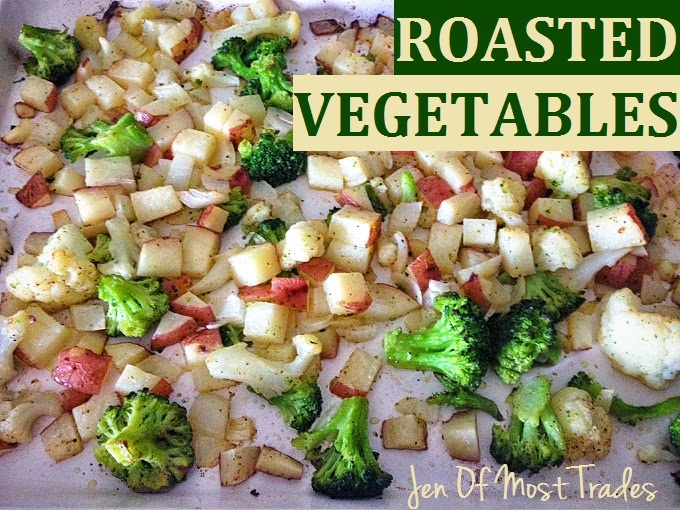 This is my favorite way to cook veggies! It’s a quick and simple process, and the texture and taste are perfect! It’s also a healthy way to cook your vegetables in comparison to the microwave, especially in those steaming plastic bags that vegetables are coming in these days. All you have to do is prepare your vegetables (wash and chop), or you could use the steamer bag vegetables if that’s what you have on hand (or any other frozen veggies). Once the vegetables are prepared, or the frozen veggie bag is opened, just spread them out on a non-stick cookie sheet. Drizzle the veggies of your choice with olive oil or coconut oil, sprinkle on salt and pepper, or any other seasoning of your choice, and toss everything together so all the veggies are coated with some oil. You can add a little bit more oil if necessary. Spread everything out on the pan in a single layer and bake in the oven at 425 degrees for 20-25 minutes. That’s it! Just let them cool before eating.